The last few times I’ve grocery shopped I’ve either forgotten or couldn’t find croutons. And yes, I did look in the bread aisle lol. All they had were what I can best describe as little Melba toast. I picked up the stuff to make “the boys ” Caesar salad and still had no croutons. How hard could it be to make little squares of stale garlicky bread lol? It is in fact very simple and very quick! I used 3 slices of plain white bread, vegetable oil, garlic powder, onion powder, oregano and a couple drops of hot sauce. I cubed the bread using my pizza cutter and cutting board. The pizza cutter made quick work with the bread. I cut my bread smaller than the usual croutons size because Chris isn’t a fan of the big crunchy brick like store bought ones. I usually partially crush those. I added my cubed bread to the mixing bowl. I tossed in the spices and mixed it up. I poured in the vegetable oil and hot sauce and mixed to coat all the bread cubes. Then I dumped the whole thing into my parchment paper lined pan. I baked it at 400 degrees for 8 minutes, pulling it out and mixing them up every 2 minutes and making sure they didn’t burn. I wanted them just to the brown and crispy stage. And that’s it, homemade croutons! Fast, easy and totally adjustable to personal preference. Preheat oven to 400 degrees. Line baking pan with parchment paper. Set aside. Cube bread using knife or pizza cutter, place in mixing bowl. Pour in vegetable oil and hot sauce, stirring to coat all the cubes. Bake at 400 degrees for 8 minutes, stirring every 2 minutes until browned and crispy, making sure they don’t burn. Store in an airtight container until ready to add to your next salad! 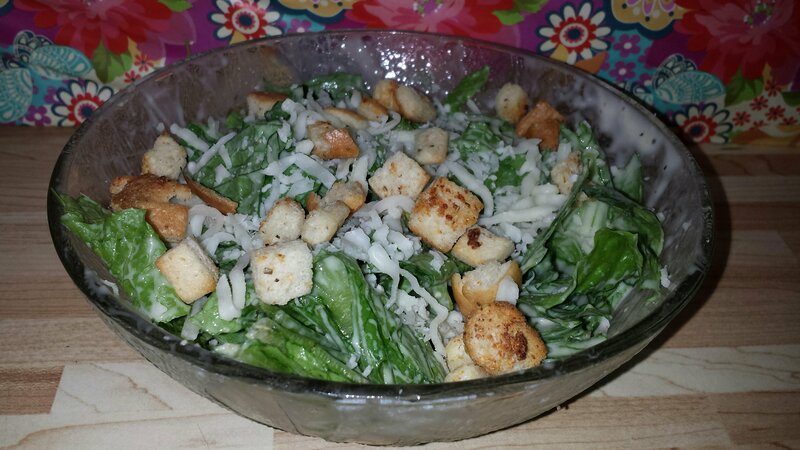 This entry was posted in Baking, Our Posts, recipes, salads and tagged garlic croutons, homemade croutons, postaday, salad topper. Bookmark the permalink. I’ll have to try this with my gluten free bread and see how that works. I miss croutons on my salad.